We have received numerous awards and accolades for our photography. Nick the owner and head photographer won Photographer of the year, Album of the year for three straight years and the top five albums in the region for two of those years. 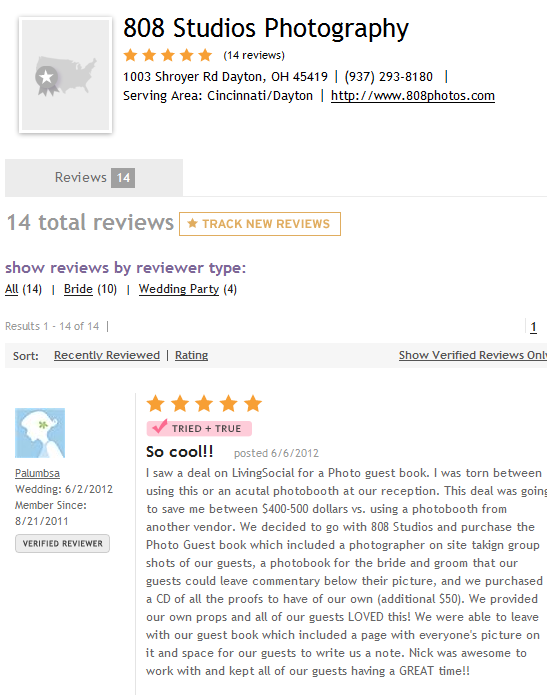 Wedding Album contests are very difficult since you’re graded on every image (sometimes 100 or more) in the album as a whole, not just one single image. Our consistency and quality is second to none and this is clearly shown in the fact that we have been so highly awarded by our peers. Over the years our images have been published in The Knot, Cincinnati Weddings, and tons of local wedding vendors websites and brochures. We’ve had several fantastic vendors seek our images to display in their shops and We are many wedding vendors first and only recommendation they make to their clients. They know we’ll take care of you and deliver exactly what you want. 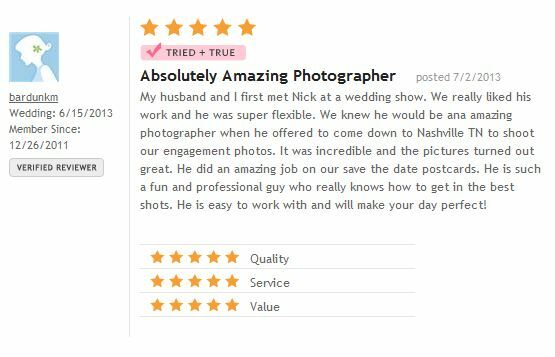 Our web based reviews are just as exciting: All 5 out of 5 stars – a perfect rating! These sites include the Knot, Wedding Channel and even Yelp! We’ve received ‘Best Pick’ of the Knot three years in a row and continue to be published on their site and their magazine.